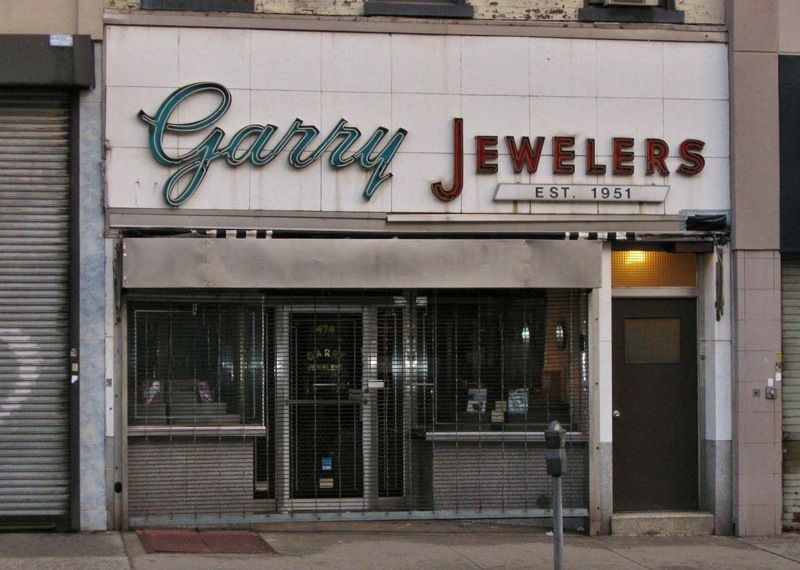 Garry Jewelers, at Fifth & 11th, still boasts one of the loveliest original 50's storefronts around, though the store itself has been shuttered for over four years. Garry closed in 2009, due to family illness. As the character of the avenue has changed since then, I've watched the empty place with growing anxiety. That sign has such an understated elegance about it, and I've passed by it thousands of times to and fro from home. It's quietly familiar. And I've missed going inside - where the store was equally vintage - and hanging around chatting to the Garafolas. How long could it stay empty? 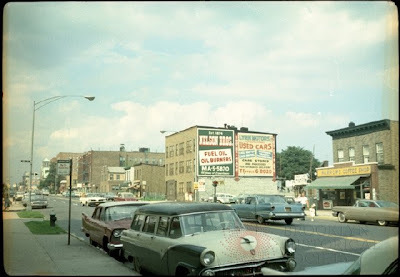 It seemed certain that one day I would see the signs dismantled, and something more nouveau-Brooklyn in its place. But maybe not so very certain. I knew the store was owned, not leased, and always saw a light in the window, with a clock that never stopped marking time. And the mail was picked up with regularity. It was a store in hibernation. Today I got word that there are some serious plans for reopening. Well, you never know with these things, and it may be more dream than reality but it's still pretty exciting news. Sunny's on Thursday, Garry's on the horizon? We live hopefully. 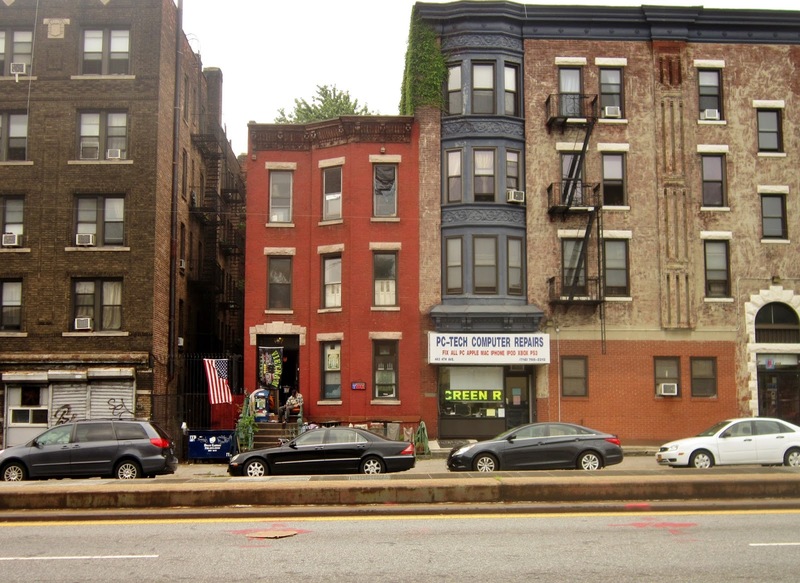 Adjacent blocks vie for attention. Sewer repairs involving big machines, a forest's worth of wood, and a small army of strong men. 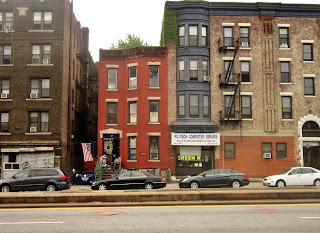 Massey Knakal Brooklyn Real Estate Summit next month - in er, Queens. With The Wailers performing at the after-party (Brownstoner). The Fusion City sign is still up at 310 9th, though the restaurant's three month run ended in June. It didn't seem to draw many customers, but the mostly Indian food was good & plentiful. A shame they didn't get a chance to make a go of things a bit longer. The replacement is coming soon though. A note in the window for Jola Mex, and a couple of ads for staff. Maybe this one will hang in there a bit longer. Camelia, up and running farther south, has the liquor-license draw of the happy (seven) hour - 12 to 7 - to help with those rent bills. Raw bar Mezini (is it still open?) seems to have ditched much of its seafood menu and gone instead for more standard Italian/American fare. 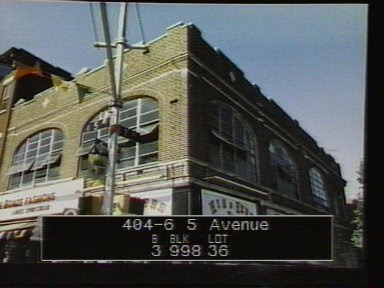 A block over from Westpfal's, at 48 West 25th: Superior Sewing Machine & Supply Corps., founded by Herb Klapper in 1949. A vision of loveliness in blue, with color coordinated Citibikes lined up in front. So here's pre-Jackie's His & Hers, at some point in the early 80s. Too bad the text blocks a crucial part of the picture. Over the course of the week I usually run into Cooky -the former longshoreman who lives nearby on Fifth - at least a couple of times. This always puts me in a good mood. Usually he's right in the same spot, the Timboo's/Skylark corner, watching the scene or chatting to friends as they pass by. Sometimes I'll see him elsewhere, but always within a three or four block radius. Cooky turned 80 this year, and has had a lot of health problems of late, but is relentlessly upbeat and a treat to talk to. And just to listen to: Cooky has an older city accent that you rarely hear round here anymore. More like something you'd hear in a film or radio clip from the '40s or '50s,, or imagine in your head as you read a Joseph Mitchell story. Oh a grand accent. The other day we talked bars, and Cooky said he used to get down to Sunny's when he was younger, when it was a busier, working man's kind of a place. Jackie's imminent closure came up too, and he said it was just about the last bar around here where someone short of money could be sure of drinks and something to eat. He said just about all the old bars along Fifth, whatever their reputation, used to look out for the hungry and thirsty, but with Jackie's gone, that would be it. Timboo's had been that kind of a place, generous with the food, and willing to overlook payment for a few drinks. He said there were a few selfish types, including one Timboo's regular who'd sooner give leftover pizza to his dogs, or even stub his smokes out in it, than share it, but most people were good-hearted. Hard times were understood . Chuckling, he said he'd once watched from his window and counted fifteen freeloaders make their way, one by one, into the bar. This sounded like an unreasonable burden for even the most generous of businesses & patrons. A small domestic mystery (The Case of the Missing Scissors) sent me to Henry Westpfal & Company (115 W. 25th) yesterday afternoon. Purveyors of knives, cutlery, sewing & leatherworking tools since 1874, Westpfal's are best known for their blade-sharpening services. Who wouldn't want to be a customer of a place with a sign like this? I sought advice from the cheery ladies at the front of the shop and now have a brand new carbon steel, lifetime-guaranteed pair of dressmaker's scissors. I'm sure this will bring the lost pair skulking out of some hidden corner, but it will be too late for them to try and curry favor. Downgraded to permanent reserve status now, the sneaky bastards. Hah. Sunny's, the Red Hook bar closed since suffering major damage during Hurricane Sandy, is re-opening on August 29th (Grub Street). This will also be the 78th birthday of bar owner Sunny Balzano. Time to celebrate! A pure Gowanus Lounge moment. 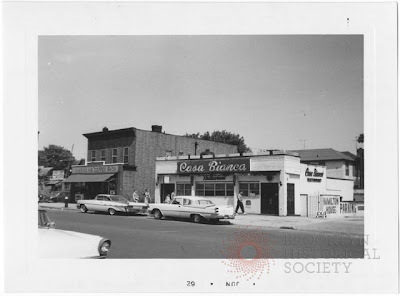 I was looking through the Brooklyn Visual Heritage collection, and by chance came across fifty year old pictures of the Narrows Coffee Shop (Fourth & 100th), one of the best extant diners in the city. If I lived nearby this one would be a regular stop-off, combining everything you look for in a local coffee shop: friendliness and neighborhood atmosphere, great service, affordability and good food, an unchanged-through-the-years sense of place. Just how unchanged - in looks at least - can be seen by comparing the then and now of '62/'63 and early 2013. A different sign, a slightly altered façade, some distinctly less stylish cars, and a Verrazano long complete, but the building itself, standing alone, looking hardly touched at all by half a century. And if you haven't already seen it, it's not too late to catch Zipper: Coney Island's Last Wild Ride at the IFC, playing a 2:15 show through Thursday 22nd. around Tuesday or so next week.